Super Fast Cancer-fighting, Anti-Inflammatory, Brain Booster Recipe! Cauliflower was one of those foods that, as kid, I turned my nose up to. I really found it abhorrent! I’m always shocked to hear how many carry that sentiment into adulthood. But since I’ve ventured out, I enjoy trying new things, and cooking in new ways. I have discovered that, not only is cauliflower delicious and extremely versatile, it’s power-packed full of health benefits, too. Cauliflower, like broccoli, is a cruciferous vegetable, which means it’s hearty, provides a good source of soluble fiber, and is rich in nutrients including vitamins, minerals, antioxidants, and other phytochemicals. 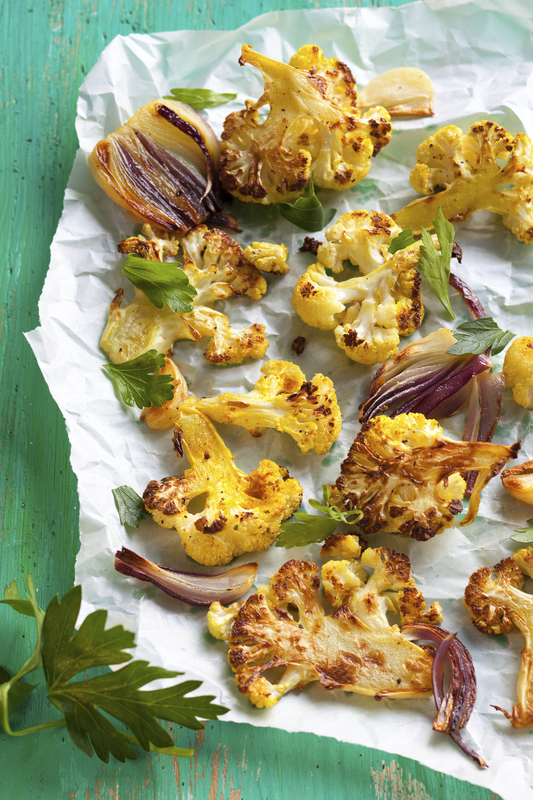 Here are just 6 of the incredible benefits of cauliflower plus a killer recipe you will want to try tonight! Digestive Health — Not only is it a great source of fiber to keep you satisfied and your bowels cleaned out, but it also contains an organic compound called sulphoraphane that protects the lining of your stomach by preventing bacterial overgrowth. Brain Power — Cauliflower is a good source of a B vitamin, called choline, that plays a role in brain development, cognitive function, learning, and memory. Anti-Inflammatory — This veggie not only keeps inflammation in check, but its particular type of compounds work at the genetic level to regulate inflammation at a foundational level. Cancer Fighting — Several compounds in cauliflower have been shown to have anti-cancer effects but once again, sulphoraphane shines as this powerful compound destroys cancer stem cells thereby slowing tumor growth. Daily Functioning — This may not sound too exciting, but many Americans are lacking the vitamins and minerals their bodies need for basic functioning. Cauliflower is a great source of vitamin C and provides vitamin K, protein, thiamin, riboflavin, niacin, magnesium, phosphorus, fiber, vitamin B6, folate, pantothenic acid, potassium, and manganese! Versatility — This veggie can be eaten raw, baked, roasted, grilled, boiled, mashed, “dipped,” riced, and even turned into pizza crust… and that list is just off the top of my head! I’m sure there are many more ways to serve up this mighty veggie. Place fish on a heavy-duty sheet of foil with the edges folded up. Drizzle with lemon, olive oil, sea salt and pepper. Allow fish to marinate for at least 20 minutes. Place cauliflower rice and sliced mushrooms in a large glass baking dish. Drizzle with olive oil, sea salt, and pepper then toss to coat. Roast for 20-30 minutes, tossing every 10 to monitor desired degree of doneness. While the veggies roast grill the fish on medium-high heat. The fish can take up to 20 minutes for a large filet. Check by inserting a fork into the center of the fish. If it feels like cutting butter, it’s ready. Remove from the grill, cover, and allow fish to rest for a few minutes. 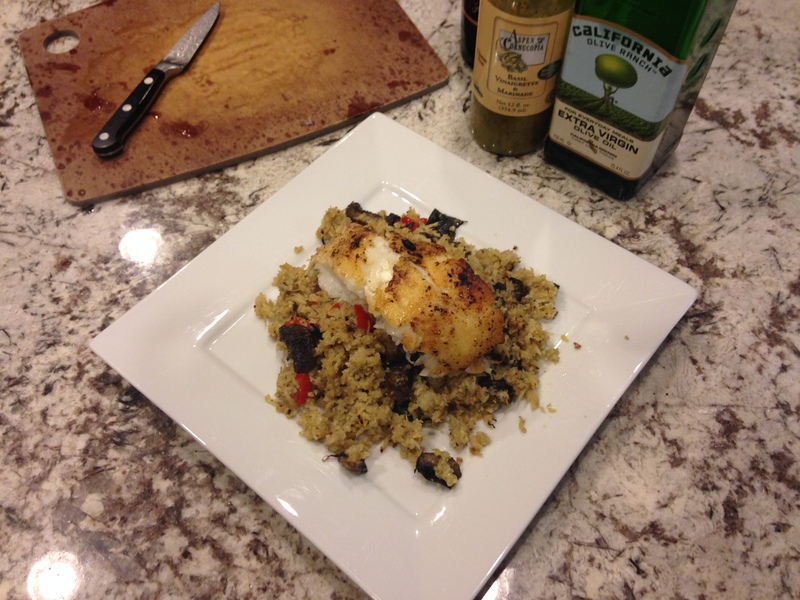 Divide into four servings, placing fish on top of a bed of roasted cauliflower rice and mushrooms. Drizzle 1 tbsp of vinaigrette over each portion. 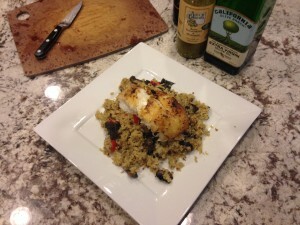 Click here to check out all of my Anti-Inflammatory Recipes.